Ever wonder where the name Doraleous came from? The creators of the show told some of their secrets at New York Comic Con. It's a strange name. Even amongst crazy fantasy-themed names like Mirdon and Drak, Doraleous seems a bit odd. So where did they come up with it? Was it inspired by famous fantasists like J.R.R. Tolkien or Robert E. Howard? Did voice actor Nate Panning spend hours poring over arcane tomes searching for the perfect moniker? Did director Jon Etheridge have a dream in which a beautiful woman clothed only in clouds sang out the name of Doraleous? "I smoke Doral cigarettes," Nate Panning said and the crowd laughed a beat later when they realized that was the entire explanation. "There's a lot of things that we get names from by just looking around the room." That kind of improvisational atmosphere infects all aspects of the show and gives the dialogue its natural feel. The team has perfected their own way of creating the weekly animated series. "Jon and I spend one night writing an outline for an episode. We come up with what's going to happen and it's usually only four or five sentences long. Then we all meet later that week with a bunch of microphones, and we pretty much improv a lot of the show," explained Brent Triplett, who plays Neebs. "We take what we like and we animate it." Brent Triplett and Jon Etheridge are the primary animators on the show; Etheridge does the character design and Triplett focuses on the backgrounds. "In the first season, Jon would send me sketches and I would paint the characters," Tripplet said. Most of the artwork is down in Photoshop and then animated in Adobe AfterEffects. Where do they get their ideas from? "Everything that's good is my idea," said Bryan Mahoney who plays Drak. "Everything that's bad is Brent's idea. Or Nate's." Mahoney did say that the fans of the show, the commenters on The Escapist, do have a say in the direction the show takes. For example, many people disliked Drak's voice so the team experimented with removing him from the show. Bruff was another example of how things changed throughout the course of the show. "Bruff was supposed to be killed off. He was made to die. That was supposed to happen around episode four or five," Tony Schnur said. Schnur plays both Bruff and Sir Walken. He auditioned for the team by doing the Cooking with Walken bit and the team loved it so much that they wrote Sir Walken into the show. The fluid nature of the story and the improv nature of how the team records each episode doesn't mean they haven't thought about the ending of the story. "We do have a pretty good idea about eventually where we're going to end up, in a lot of different ways." Panning said. The whole team of Doraleous and Associates are a great bunch of funny and charismatic guys. They knew each other well and play to each other's comedy strengths. 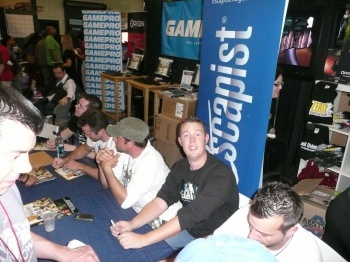 Watching them interact at the panel with fans was great, but it was even more amazing to see so many people come to The Escapist booth at New York Comic Con to pay a visit, get some signed posters and interact with the Doraleous team. It was a joy for the people who already know about the show, but Doraleous and Associates made a lot of new fans at New York Comic Con as well.